"Our guide, Ilker, was THE BEST guide we have ever experienced. He was skilled at making the stones of the monuments and temples come alive with history. He connected with the tour goers on a caring and personal level. What a gem! Ahmet our driver was invincible. One suggestion: drive through Pamukkale and on to Bursa. We needed more time to enjoy that lovely city. The Five Star hotel in Pamukkale was very disappointing. " Marmaris to Fethiye sailing on the Mediterranean visiting secluded coves and islands, swimming, sunbaking and relaxing. All meals cooked and served on-board. We begin boarding the Gulet at Marmaris Harbour at 3:30 pm. Relax at the pre-cruise information session. Enjoy an onboard dinner while meeting the other passengers. After breakfast we cruise to Ekincik and the beautiful beach of Izturu, which is famous for the sea turtle called Carette. The ancient city of Caunos is closeby where you can take a boat trip up the Dalyan river, passing Lycian rock tombs on the way to the sulphurous mud baths and hot springs. We will sail towards world-famous Gocek Gulf and anchor at Tersane Island for breakfast and swimming break. We will cruise to Monastery Bay which is also known as Cleopatra Bay or Sunken Bath Bay due to the beautiful underwater ruins of an old bath. Arrive at Fethiye Harbour early in the morning where you have chance to visit city centre. We offer the option of a jeep safari tour in Fethiye. For those who will not join the Safari, the boat will cruise to Samanlik Bay for lunch and swimming. Afterwards around 16.30 the boat will anchor at Ece Saray Marina, Fethiye, and guests will leave the boat with precious memories. 1. 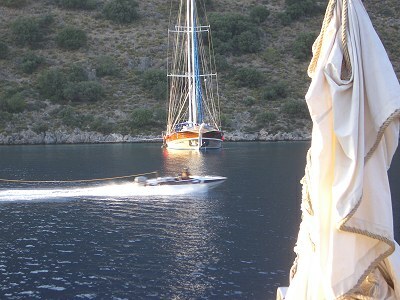 Gulet itineraries are subject to change without notification. The captain of the craft will decide the program at the time. 2. All cabins have double beds. Most people choose to sleep under the beautiful Mediterranean sky on mattresses on the deck, and only use their cabins as a wardrobe. 3. Single travellers are obliged to pay Single Supplement and will have the cabin to themselves. 4. 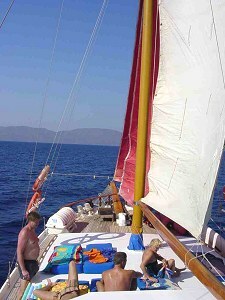 Gulet cruises have a minimum age of 12 years old. 5. Towels, soap, shampoo and any other personal items need to be provided by the customer. 6. Electric devices may be charged on-deck and in some cabins. 7. Drinks are available for purchase on board, tea and coffee are included with breakfast. 8. This cruise finishes at Fethiye Harbour on the final day at approximately 16:30 pm.